Hurricanes redshirt junior pitcher Brian Van Belle is an unconventional arm in Miami’s rotation. The Pembroke Pines, Florida native is not a natural flamethrower like his counterparts on the starting staff. Rather than lighting up the radar gun, Van Belle uses command and movement to get outs. 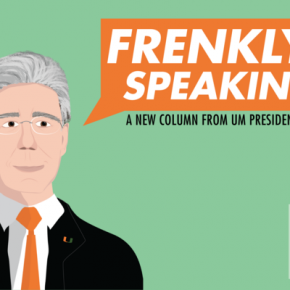 And just like his pitching style, Van Belle’s journey to the University of Miami was different from those of his teammates. Van Belle attended Archbishop McCarthy High School, one of the many powerhouse baseball schools in South Florida. Yet, he had to work his way up to even play at the varsity level. When Van Belle reached the varsity team, he had only one goal on his mind—receiving a scholarship from an NCAA Division I university. However, Van Belle’s physique was a major roadblock. Van Belle stood at 6 feet tall and only weighed 140 pounds, scaring off many collegiate programs. In the end, Van Belle received just two scholarship offers, both from junior colleges. “We sold him on how we could change him and make sure he was on the mound,” Bizier said. After contemplating his options, Van Belle committed to Broward College in the late fall of his senior year of high school. But it was clear that attending a “JuCo” was not the ideal situation for Van Belle. Instead of stylish Adidas jerseys and jackets, Van Belle wore a plain Hanes T-shirt that read the word “Broward” on it. Being a pitcher at a junior college was never lavish, but things got worse for Van Belle. The right-hander had Tommy John surgery and was forced to sit out his first two seasons with the Seahawks. All Van Belle could do was patiently wait and support his teammates, but there was a light at the end of the tunnel. Through his recovery and training, Van Belle came back for the 2018 season better than ever. In 11 starts, Van Belle finished 5-1 with a 4.15 earned-run average and 48 strikeouts to lead the Seahawks to a Southern Conference Championship. With his redshirt sophomore performance, Division I schools gained interested in Van Belle. 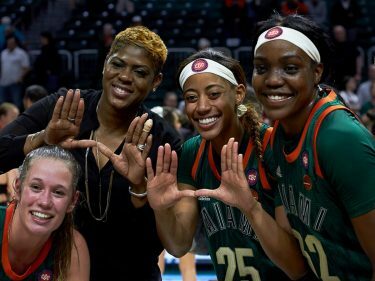 Receiving an offer from UM was a dream come true for Van Belle. From day one, Van Belle was determined to make an impact on the Hurricanes’ pitching staff, and his hard work paid off. First-year head coach Gino DiMare and his staff elected to put Van Belle in Miami’s weekend rotation. When Van Belle heard the news, he was stunned. Van Belle owns a 5-2 record and leads the Hurricanes’ starting rotation with a 3.28 ERA. 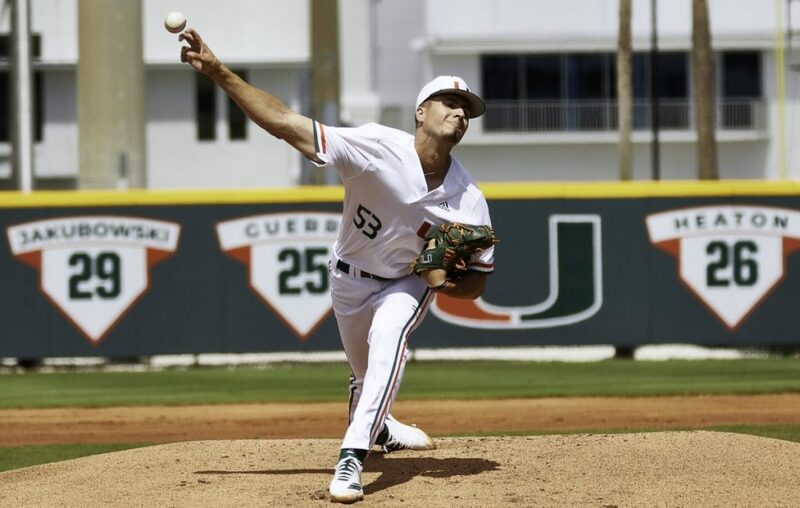 He has struck out 53 batters through his first nine starts, helping Miami rank as the second-best pitching staff in the Atlantic Coast Conference. Van Belle continues to thrive in the rotation for Miami and uses one major lesson he learned at Broward College: get better today. “Every time we would ask Brian how he was doing, he would say, ‘Just trying to get better,’ and he still has that attitude,” Bizier said. Van Belle aims to improve with every outing, every out and every pitch. The Hurricanes look to extend their winning streak to six games when No. 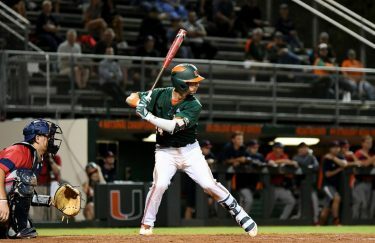 23 Miami hosts Florida Gulf Coast Tuesday at Mark Light Field. First pitch is set for 6 p.m.